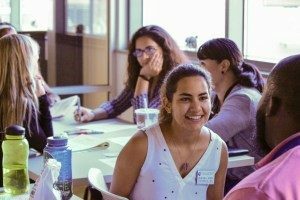 After an exploratory look at new data about health at the neighborhood level , we announced at Data Day 2017 that we’d be convening a Health data Users Group (HUG) to help Milwaukee dataphyles share their knowledge, connect with other like-minded people and use data to improve health in neighborhoods. 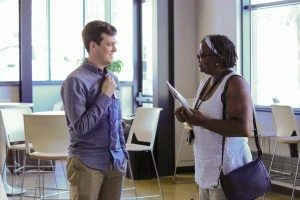 HUG’s introductory session included people from neighborhood groups, the City of Milwaukee Health Department, Zilber School of Public Health, community health clinics, and hospital systems. The founding group established operating guidelines for future meetings, selected a time and location for the first official meeting and decided upon a quarterly meeting schedule. Suggested topics for future HUG gatherings included: women, infants, and children (WIC) data, lead abatement data, and new health data sets. The HUG founders were also interested in inviting speakers who work outside of traditional health fields like safety and urban planning, to reduce data silos. Michael Stevenson and Salma Abadin from the Milwaukee Health Department demonstrated how the Department is using Tableau to create interactive data dashboards which are publicly available. Kevin Engstrom of Sixteenth Street Community Health Centers presented on electronic health records to inform programming and measuring long-term health impacts of a major infrastructure project. Christy Vogt from Wisconsin Department of Health Services presented on the Wisconsin Environmental Health Tracking data portal, which includes the data they host, how to access and use the portal, and resources for translating data into action. Jennifer Hernandez-Meier and Sarah Kohlbeck from the Medical College of Wisconsin presented on The Cardiff Model and using Electronic Health Records. Gerardo Mares of the Milwaukee Police Department presented an analysis Domestic Violence in the Amani neighborhood. Captain Wright presented on the Milwaukee Fire Department’s Community Paramedic Mobile Integrated Healthcare Program. The program has successfully reduced frequent 911 calls for non-emergency situations, which helps ensure more resource is available for an actual crisis. Sergeant Fadness presented on the Franklin Police Department Special Needs Registry. The registry provides police officers information of high risk individuals and enables them to appropriately address the unique cases in the community. Donald Schaewe of the Department of Neighborhood Services discussed rats in Milwaukee ( DNS Rat Presentation) how the City tracks complaints and their connection to public health. Kori Kenney from the Milwaukee Metropolitan Sewerage District shared information on carnivorous microbes that live in the aeration basins and clean the water. Mark Huber and David Frazier discussed the Milwaukee Health Care Partnership’s Milwaukee County Health Needs Assessment and the new data set, Health Compass Milwaukee. Peter Eckert and Anna Barnes from the Illinois Public Health Association briefed us on the work of Data Across Sectors for Health and ALL IN- Data for Community Health. If you are interested in hearing more about HUG or becoming a member of this user group, please join our mailing list here!